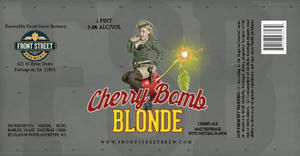 From Front Street Brewery in Davenport, Iowa – An American light hybrid beer with a mild, moderately sweet malt flavor and subtle fruitiness courtesy of the cheery. The result is a refreshingly light and aromatic brew – an instant classic! A five ounce lobster tail can be added to any meal for $11.00. Wild caught Atlantic Lobster, drizzled with burre blanc sauce, and sprinkled with fresh chopped parsley. House made Key Lime Pie. Made with condensed milk same as they do it in the keys. Its the best there is. Served with whipped cream. A one pound whole catfish either fried, or broiled. Served with choice of side and a salad. House made to order linguine with alfredo sauce and generous amounts of shrimp, mushrooms, and green onions. Served with choice of salad and breadsticks. 8 ounce hand cut filet of Faroe Islands Atlantic Salmon, smeared with Boetjes Mustard, and broiled with brown sugar and cracked black pepper. Served with onion straws atop.